The first instalment of a two-part story detailing the life and times of Tom Arter – racer, enthusiast, sponsor and supporter. There are many motorcyclists with workshop skills. Some of them seem able to solve any problem that an errant combustion engine might possibly throw at them. But the broadest of skill-sets is not yet able to tackle mortality. Family and friends are left with the sad, often long and onerous task of clearing a now-quieted workshop. Yet, when Richard Mummery was invited to help with such a commitment, his anticipation went as far as paying for the opportunity. But this was no ordinary workshop. The facility concerned was the race shop of Arter Brothers, presided over for years by Tom Arter. Bikes prepared on the premises had been ridden by a host of riders – aces and also-rans – sometimes on a one-off basis, others for several seasons. 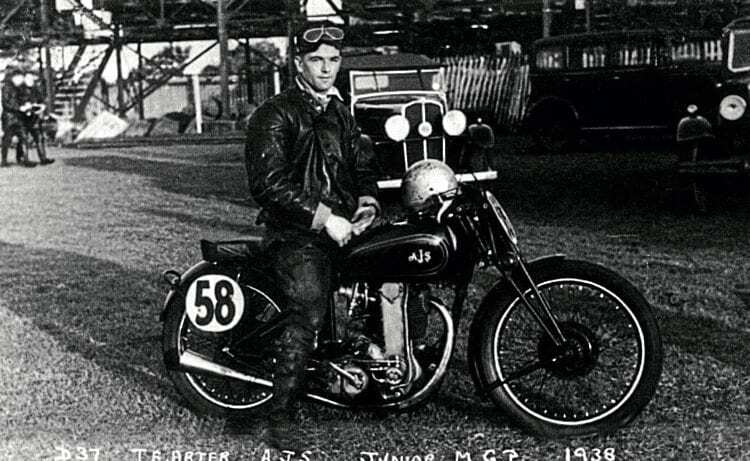 The 1938 Manx Grand Prix was Tom Arter’s only race in the Isle of Man. He came 14th in the Junior race on his AJS R7. The company had long been agents for AMC motorcycles and Tom had an unswerving allegiance towards its products, continuing even after the factory had closed. Richard had grown up in the locality and had a lifelong awareness of Tom and most of the Arter family and well knew the significance of the race shop. In the years before he died in 2000, Tom had wound down his racing activities. The stable of race bikes had been sold at auction, but a few new but mainly used spares, as well as a detritus of unidentifiable parts for disparate machines, remained. Tom knew Richard would occasionally take a stall at a local jumble and so the clear-out should have been mutually beneficial.